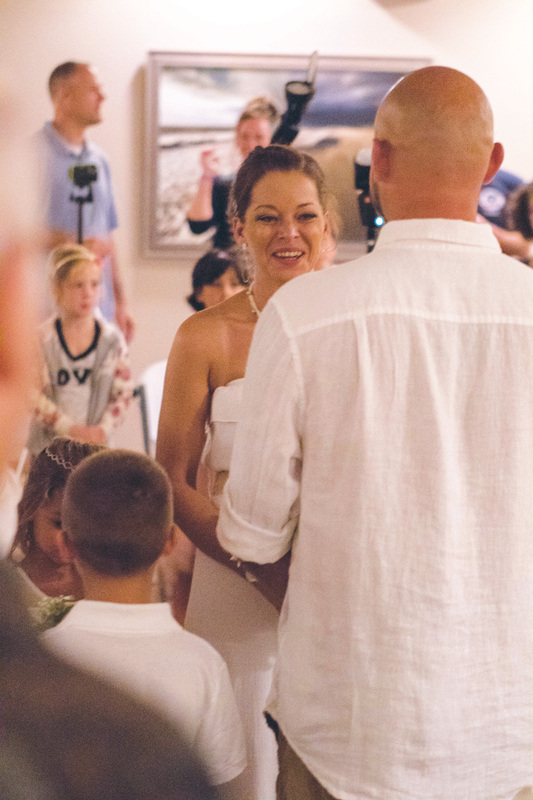 Retired U.S. Marine Greg Gerard, his fiancée, Amber Falck, and family tie the knot at the Edgewater House community room at Sea Colony during Operation SEAs the Day. Amber Falck and Greg Gerard exchange vows infront of family and friends. 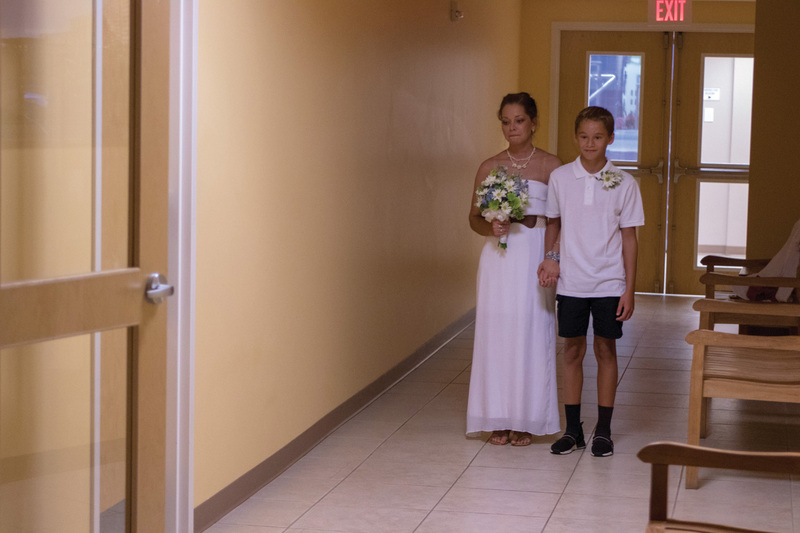 When retired U.S. Marine Greg Gerard and his fiancée, Amber Falck, packed their three kids and Gerard’s service dog Infidel in the car for a week at the beach, they had no idea they’d end the week with a wedding, let alone that it would be their own. The five — actually, six, including Infidel — Greg, Amber and their children, Gage, 12; Gavin, 7; and Aubrie, 5, were in Bethany Beach last week for Operation SEAs the Day’s Warrior Beach Weekend. This wasn’t the Conestoga, Pa., family’s first trip to the Delaware beaches for the annual retreat week for wounded veterans and their families. They first came as one of 32 Very Important Families (VIFs) in 2017, and were returning as “alumni” to help this year’s first-time families take full advantage of all that Operation SEAs the Day has to offer. Ever since Gerard suffered a gunshot wound in his right leg while deployed more than 10 years ago, his life — and his family’s as well — has revolved around first trying to save his leg (which is technically called “limb salvation”) at Walter Reed Army Hospital in Bethesda, Md., then the amputation, then dozens of follow-up surgeries and subsequent rehabilitation. Twelve years and 34 surgeries — six just since last November — later, he’s still fighting, he said. “There’s still going to be more surgeries,” Gerard said, although he said he hopes they will be less frequent than his current average of two surgeries per year. In the past year, Infidel joined the family and has been, Gerard said, “a life-changer. He can open doors, close doors, bring me my [prosthetic] leg; I can give him my credit card,” he said, when Gerard wants to purchase something. And when he’s “off-duty,” the dark-furred German shepherd is “just like a normal dog… as soon as you take that vest off of him,” Gerard said. Gerard and Falck, both 35, had known each other since they were schoolkids and have been a couple for 10 years, he said. By the end of the night, emails and texts were flying, and a wedding was in the works. About 50 people attended the ceremony, which was originally planned to take place on the beach, but due to rain was held the Edgewater House community room at Sea Colony. The guests were a mixture of VIFs and volunteers, and service dogs. Falck wore a white strapless maxi-dress; Gerard wore khaki cargo shorts and a white cotton shirt. The boys wore white polo shirts and dark shorts, while Aubrie wore a white dress. Infidel wore his work vest. Falck’s dress was donated by Lili Oller of local retailer Water Lili, who also supplied jewelry to finish off her outfit. The children’s clothes were procured by Operation SEAs the Day’s Becky Johns. Falck’s up-do hairstyle and makeup, and Aubrie’s hairdo — topped with a delicate flower-girl corona — were donated by the All About U Salon in Millville. 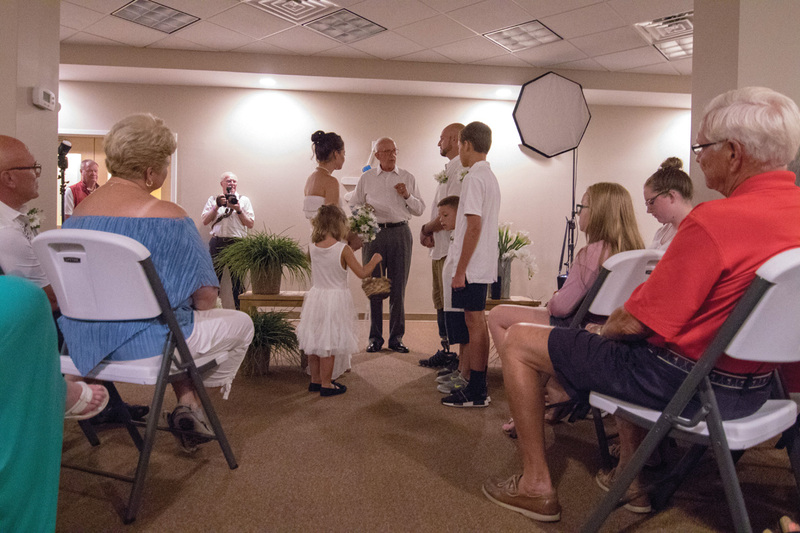 The Coastal Camera Club supplied two photographers, who brought studio lights for formal wedding photographs. 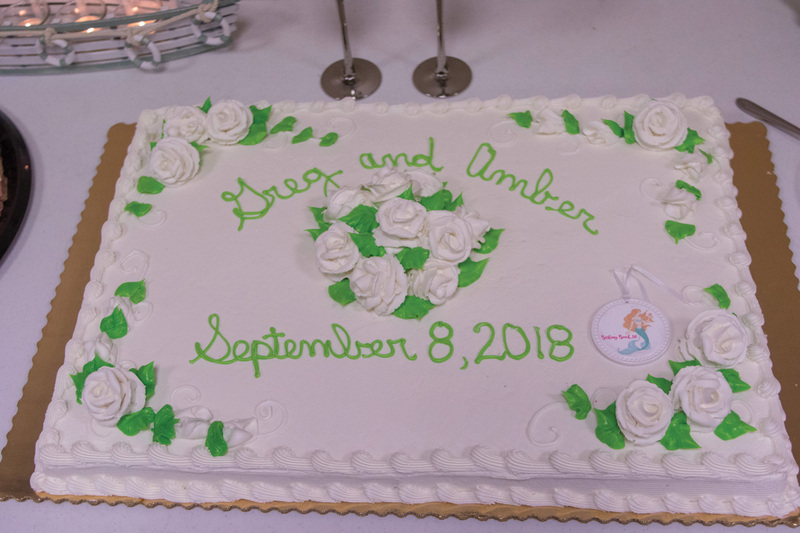 After the wedding, guests were invited to share in wedding cake and other treats supplied by the Super Giant grocery store in Millville and champagne donated by Bethany Beach Liquors. Flowers were supplied by Bethany Beach Florist. Throughout the day there were tears, laughter and smooshed cake. Infidel, however, behaved himself. 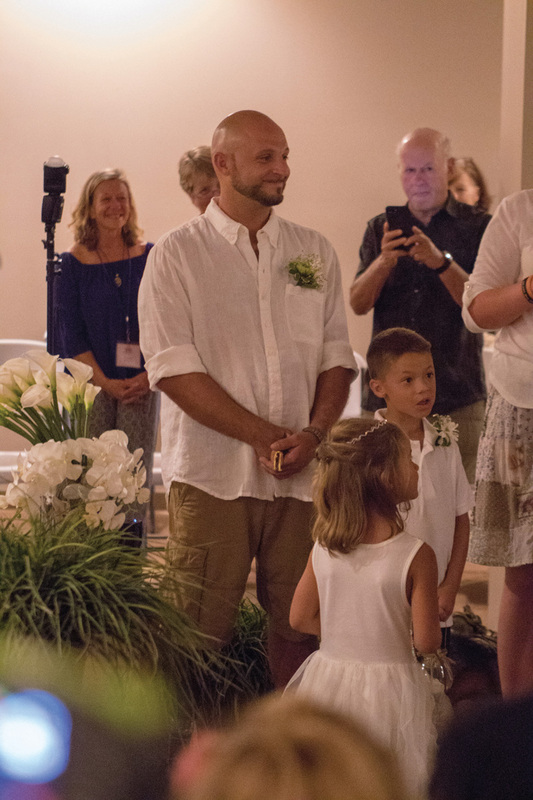 Although there have been, according to Operation SEAs the Day volunteer Bill Gay, four vow-renewals during previous Warrior Beach Weeks, this was the first actual wedding in the six-year history of the program. Afterward, against the backdrop of a 2-foot wooden dragonfly hand-made for the couple by a volunteer who had heard that dragonflies held special significance for Falck’s family, the two exchanged vows they had written hours earlier, in between wrangling children, dodging a rainstorm and cramming in a few more hours of vacation. “I am so proud to have you as my husband. Finally,” the bride said, to laughter from the guests. “You make me feel like the luckiest girl in the world… Wherever life leads us, I promise to always make our family’s love and happiness my life. “I even promise to allot small timeframes in life to count ammo and clean guns with you,” she said. Amber Gerard said she was “mind-blown” and “overwhelmed” with the generosity of all who contributed to the Gerard family’s big day. Although Amber’s parents had been with them earlier in the week, Greg’s mother, Carol, was able to be there for the actual ceremony. Mother and son shared a tender moment before the ceremony, with volunteers scurrying all around them, arranging food, setting up chairs and camera lighting — Greg placing a wrist corsage on his mom’s arm. Gerard said that, while the wedding was amazing, he’s come to expect nothing less from Operation SEAs the Day. Throughout the week, he said, “There were so many ears listening, just making things happen. I give so much credit to SEAs the Day,” he said.